Albert van der Sel : Vector calculus. In the series: Note 12. Subject: Vector calculus / Linear Algebra Part 1 (introducing vectors). Remark: Please refresh the page to see any updates. Status: Ready. But I will add more sections to this note. This note is especially for beginners. Maybe you need to pick up "some" basic "mathematics" rather quickly. So really..., my emphasis is on "rather quickly". So, I am not sure of it, but I hope that this note can be of use. Ofcourse, I hope you like my "style" and try the note anyway. Note 3: Quadratic Equations and polynomials. Note 4: The sine/cosine functions. Note 5: How to differentiate and obtain the derivative function . Note 7: The ex and ln(x) functions. Note 8: Primitive functions and Integrals. Note 10: Differential equations Part 1. Note 11: Functions with two or more variables. This note: Note 12: Vector calculus / Linear Algebra Part 1. For Vector calculus / Linear Algebra Part 2: please see note 16. Each note in this series, is build "on top" of the preceding ones. Please be sure that you are on a "level" at least equivalent to the contents up to, and including, note 11.
of an object, or the charge of some particle etc.. You cannot "associate" a direction to these examples. Although math has rather complete theories on vectors, physics is full of real vectors. In physics, indeed many examples are available, such as "forces", "velocities, "vector fields" etc.. In a Cartesian coordinate system, we can represent vectors, by "arrows" from the Origin, to a certain point (x,y,z). In figure 1 below, you see some vectors in three dimensional space R3. Let's take a look at, for example, the point (1,2,4). You can see the "arrow" from the Origin to (1,2,4). It has a direction in space, and a certain magnitude (it's lenght). like (x1, x2, .., xN). Figure 1. Some examples of Vectors in a Cartesian coordinate system. but they are usually written as (x,y). a length of "1". So, in figure 1, we have 3 unit-vectors, positioned along the x-, y-, and z-axis. In figure 1, those are represented by the "red" arrows. Since the x-, y-, and z axes are perpendicular, so are those unit vectors to each other. We may write vectors as an "n-tuple" like for example (1,0,2), or in column notation like shown in figure 1. 2 x (0,0,1) ( is the unit-vector along z-axis). Note that vector B has no "y component", so that's why we have "0 x (0,1,0)". Also, often the multiplication symbol "x" is left out too. or a range of other symbols. Here I will just use Capital Letters. So, simply add all corresponding x-, y-, and z-components. Ofcourse, the same principle applies for any orthogonal cartesian frame of reference, of any dimension. are easy to draw, so I can nicely illustrate vector addition. Take a look at figure 2 below. Figure 2. Adding two vectors in R2 (the XY coordinate system). As you might see in figure 2, we have C = A + B = (3,4) + (-4,2) = (-1,6). If the vectors A an B in figure 2, would represent physical Forces, then C would be the resultant Force. it would be exactly the same is if only C was working on that mass. In that sense, C acts as if it completely replaces A and B. Or stated differently, C is the vectorsum of A and B. We only need to consider C if we would study that system further. can be represented by the arrow to the point (0,4). This time, the resultant force is exactly "in the middle" of A and B.
and makes it symmetrical, just as you probably would expect in this example. I am not great in webprogramming. You know, I just do everything with "vi" or "notepad", depending on the platform. Yes! It shows. I know that my pages are horrible in formatting and how they look. Sorry for that. Especially with older browers it can be a mess. The "length", or "magnitude", of vector A, is often denoted as |A|, but many other notations go around too. along the x-, and y-axes, form a right-angled triangle. It also is true in any orthogonal Cartesian frame of reference, of any dimension. Also, suppose λ is a scalar. any point along the (infinite) line, where vector A is aligned on. In row notation, in R2 we have the unit vectors (1,0) on the x-axis and (0,1) on the y-axis. and (0,0,1) on the z-axis. You know that you can write them in "column" format too, ofcourse. In orthogonal Cartesian coordinate systems, there is no difference between the "row" and "column" way of notating vectors. the format does matter. This will not be discussed in this note. See note 16.
you can encounter many sorts of symbols. êx = (1,0,0) for the unit vector on the x-axis. êy = (0,1,0) for the unit vector on the y-axis. êz = (0,0,1) for the unit vector on the z-axis. êx = (1,0) for the unit vector on the x-axis. êy = (0,1) for the unit vector on the y-axis. Ofcourse it can be very handy to have such a short notation for basis-vectors, in many occasions. What we saw in section 1.4, was "no more" than the multiplication of a vector with a number λ. -The "inner product" of two vectors, which produces a number. -The "cross product" of two vectors, which produces a vector again. Both types have a pretty cool interpretation, as you will see. However, I consider section 2.2, about the "cross product", as optional reading. So, you simply multiply the corresponding vector components. It's that simple. In R2, it goes in a similar way. Here the vectors each have only two components. The last term, we use the "Σ" symbol, which is a shorthand notation for a summation "over" i, where i runs from 1 to N.
If B is a unit vector, then "A · B" is simply the length of A along the corrsponding axis of that unit vector. I will make that likely first, and then go to a general statement. Take a look at figure 3. Here we see vector A again from figure 2. Figure 3. 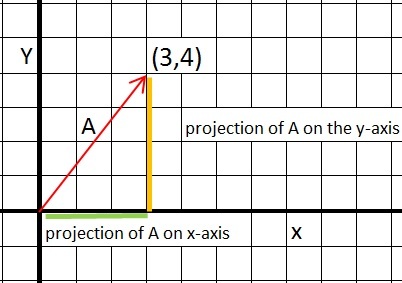 The projection of A on the x-axis. Or, the inner product of A with (1,0). The green linesegment, is exactly the x component of vector A. It has a length of "3". It's the length of the "projection" of A on the x-axis. The orange linesegment, is exactly the y component of vector A. It has a length of "4". It's the length of the "projection" of A on the y-axis. Let's calculate the inner product of A with (1,0) and (0,1) respectively. A · êx = 3 x 1 + 4 x 0 = 3. A · êy = 3 x 0 + 4 x 1 = 4. You see that? The "inner products" relates to the length of A on the x-, and y-axes. Well, at least from this example, the "interpretation" is correct. There is another important equation for the inner product of the vectors A and B. From note 4, which dealt on the sine and cosine functions, you know that "the length of the green line"
as shown in figure 3, corresponds to "|A| cos(α)", where α is the angle between A and the x-axis. Note that this relation is equivalent to "|A| |êx| cos(α)", where |êx|, thus the "length"
you are able to determine the lengths |A| and |B|, and the angle between those two vectors. ly on the x-, y- and z-axes. It is not only true for basis vectors. If any two vectors are perpendicular, the inner product is "0". 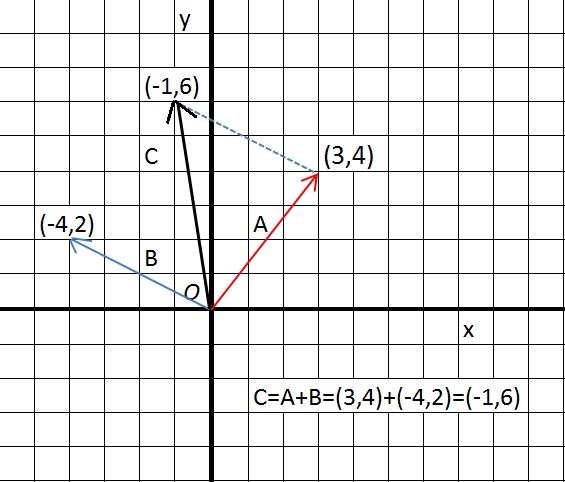 Take for example the perpendicular vectors A=(-1,2) and B=(2,1) in the XY coordinate system. is true for perpendicular vectors. You can also deduce it from "A · B = |A| |B| cos(α)", since if A and B are perpendicular, then cos(α)=0. This "vector product" called "cross" or "outer" product, is only possible (or valid) in three-dimensional space R3. The cross product of two vectors, is a new vector. This is very different from the inner product, since that returns a scalar. For the time being, the inner product is much more important to us, than the cross product. you are aware of it's existence. But it is used often in "physics". Some nice examples exists, and here I will use one such example. vectors are in. The vector which is called the "outer product" vector, is always perpendicular to that plane. Let's spend a few words on a subject in Physics. Suppose we have a charged particle, which moves with a certain velocity "V". Velocity has a magnitude (the speed) and a direction, and thus it can be described by a vector. Suppose further, that this particle moves through a Magntic field "B". 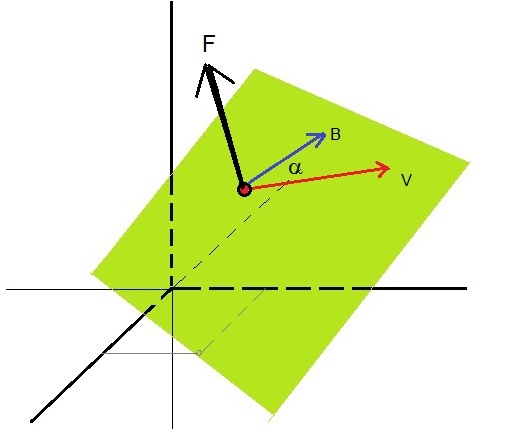 a Force, which is always perpendicular to the plane identified by "B" and "V". I am not much of an artist, but I tried to illustrate that in figure 4 below. Figure 4. The force on a charged particle, moving in a Magnetic field. It's remarkable that the Force vector is perpendicular to both the particle's motion and B field. in his theories, and those theories explains the observed behaviour, which is outside the scope of this note. Where F=Force vector, V=Velocity vector, B=Magnetic field vector, and q (which is scalar), is the charge of the particle. where "v" is the magnitude of V, b is the magnitude of B, and α is the angle between V and B. The vector product is called "cross product" and implies a third vector (in this case "F") perpendicular to both other vectors. |C| = |A x B| = |A| * |B| * sin(angle A,B). Even at this point, I consider this note already to be "fairly usable"
if you were really new to this subject. For a follow-up, like subjects as matrices and other more advanced topics: please see note 16. That's it. Hope you liked it!